1. Mix all the ingredients listed above under Marinade for Prawns and keep aside for ½ to 1 hour. 2. Wash the rice thoroughly. Soak it with 2 cups water and all the ingredients listed above under Steamed Rice. Soak for an hour or so. Steam cook rice in a double boiler. Keep aside when done. 3. Heat oil in a small frying pan, and fry the onion for 5 minutes or until crisp and golden brown. Set aside. 4. Heat 2 tablespoon Oil and 1 tablespoon ghee in a heavy bottom pan. 5. Add the marinated prawns and saute for a minute. 6. Add a layer of fried onions, Pudina leaves, and coriander leaves. 7. Sprinkle half of the Biryani powder. 8. Add a layer of the cooked rice. 9. Repeat the layers one more time. 10. Cover the pan with a lid. 11. Cook on high flame for 2 minutes. 12. Reduce the flame and cook for 1 minute. 13. 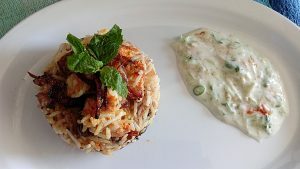 Garnish with fried onions and serve with raita.